We are in the process of rolling out our new SIMS Parent App to our CHS community. What can I see or do on the SIMS Parent app? SIMS Parent App enables you to access real time information about your child such as achievement, homework, attendance, timetable and reports, as well as offer the opportunity to update the school with key contact information. As the Parent App is rolled out you will receive an invitation code to join SIMS Parent app. The invitation will have been received from noreply@sims and will be valid for 14 days. Usernames and passwords are not issued directly by the school as parents can use their existing Facebook, Twitter, Google or Microsoft Account credentials. 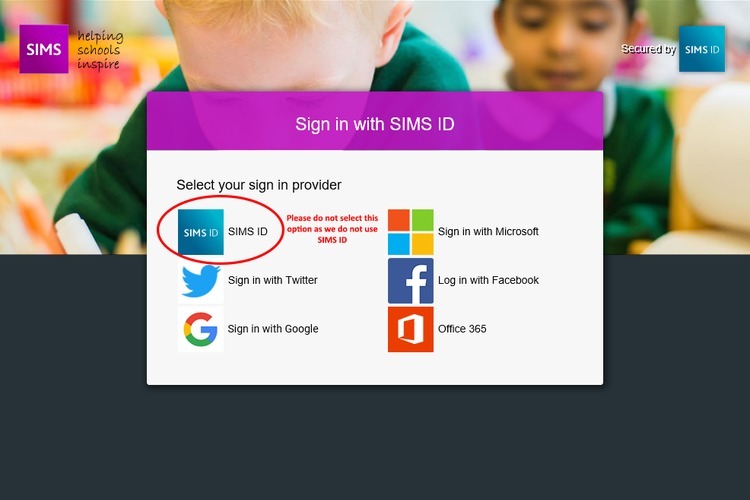 If you have any issues with signing in to the SIMS Parent App or if you are not currently registered for the SIMS Parent App and would like to sign up for it then please contact the school. The App is available on Apple & Android devices please click below to download the appropriate app. www.sims-parent.co.uk. Below is an image showing what the logon page looks like.